Abba Eban (/ˈɑːbə ˈiːbən/ ( listen); Hebrew: אבא אבן [ˈʔaba ˈʔeven]; born Aubrey Solomon Meir Eban; later adopted Abba Solomon Meir Eban; 2 February 1915 – 17 November 2002) was an Israeli diplomat and politician, and a scholar of the Arabic and Hebrew languages. Born in Cape Town, South Africa, on 2 February 1915 to Lithuanian Jewish parents, Eban moved to the United Kingdom at an early age. As a child, he recalled being sent to his grandfather's house every weekend to study the Hebrew language, Talmud, and Biblical literature. He lived for a period of time in Belfast. He was educated at St Olave's Grammar School, then in Southwark, before studying Classics and Oriental languages at Queens' College, Cambridge, where he achieved a double first. During his time at University and afterwards, Eban was highly involved in the Federation of Zionist Youth and was editor of its ideological journal, The Young Zionist. After graduating with high honours, he researched Arabic and Hebrew as a Fellow of Pembroke College from 1938–39. At the outbreak of World War II, he went to work for Chaim Weizmann at the World Zionist Organization in London from December 1939. He served in the British Army in Egypt and Mandate Palestine, becoming an intelligence officer in Jerusalem, where he coordinated and trained volunteers for resistance in the event of a German invasion, serving as a liaison officer for the Allies to the Jewish Yishuv. After the war he continued in his post, helping to set up and run the British Foreign Office's Middle East Centre for Arab Studies which was originally based in Jerusalem before relocating to Shemlan near Beirut. He was at that time known as "Aubrey Evans". In 1947, he translated from the original Arabic, Maze of Justice: Diary of a Country Prosecutor, a 1937 novel by Tawfiq al-Hakim. Eban moved back to London briefly to work in the Jewish Agency's Information Department, from which he was posted to New York, where the United Nations General Assembly was considering the "Palestine Question". In 1947, he was appointed as a liaison officer to the United Nations Special Committee on Palestine, where he was successful in attaining approval for the recommendation of partition of Palestine into Jewish and Arab segments—Resolution 181. At this stage, he changed his name to the Hebrew word Abba, meaning "Father". I have never encountered anyone who matched his command of the English language. Sentences poured forth in mellifluous constructions complicated enough to test the listener’s intelligence and simultaneously leave him transfixed by the speaker's virtuosity. His grasp of history and fluency in ten languages enhanced his speech-making in the United Nations, even to skeptical or hostile audiences. In 1952, Eban was elected Vice President of the UN General Assembly. A collection of Eban's speeches before the United Nations’ Security Council and General Assembly both at universities and other venues between 1948 and 1968 was compiled in Voice of Israel, recently reissued in eBook form by Plunkett Lake Press. He was known for his witty remarks. For example, when he was complimented on his perfect Oxford English he replied "Cambridge actually, but in politics one expects to be smeared". Eban left the United States in 1959 and returned to Israel, where he was elected to the Knesset (the Israeli parliament) as a member of Mapai. He served under David Ben-Gurion as Minister of Education and Culture from 1960 to 1963, then as deputy to Prime Minister Levi Eshkol until 1966. Through this period (1959–66), he also served as president of the Weizmann Institute in Rehovot. 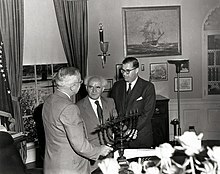 From 1966 to 1974, Eban served as Israel's foreign minister. He defended the country's reputation after the Six-Day War by asserting, in a speech to the United Nations General Assembly, that Israel acted in response to an imminent threat: "So on the fateful morning of 5 June, when Egyptian forces moved by air and land against Israel's western coast and southern territory, our country's choice was plain". Nonetheless, he was a strong supporter of trading parts of the territories occupied in the war in exchange for peace. He played an important part in the shaping of UN Security Council Resolution 242 in 1967, as well as Resolution 338 in 1973. Among his other high level contacts, Eban was received by Pope Paul VI in 1969. Eban was at times criticized for not voicing his opinions in Israel's internal debate. However, he was generally known to be on the "dovish" side of Israeli politics and was increasingly outspoken after leaving the cabinet. In 1977 and 1981, it was widely understood that Shimon Peres intended to name Eban Foreign Minister, had the Labor Party won those elections. Eban was offered the chance to serve as minister without portfolio in the 1984 national unity government, but chose to serve instead as Chair of the Knesset's Foreign Affairs and Defense Committee from 1984 to 1988. His comment that Arabs "never miss an opportunity to miss an opportunity" (i.e., for peace), made after the Geneva peace talks in December 1973, is often quoted. Abba Eban (left) escorting the King of Nepal in a 1958 visit to the Weizmann Institute in Rehovot. Shortly after the visit, Eban became President of the Institute. In 1988, after three decades in the Knesset, he lost his seat over internal splits in the Labour Party. He devoted the rest of his life to writing and teaching, including serving as a visiting academic at Princeton University, Columbia University and George Washington University. He also narrated television documentaries including Heritage: Civilization and the Jews (PBS, 1984), for which he was host, Israel, A Nation Is Born (1992), and On the Brink of Peace (PBS, 1997). Eban died in 2002 and was buried in Kfar Shmaryahu, north of Tel Aviv. He was survived by his wife, Suzy (née Ambache), who died in 2011, and their two children. Eban's son, Eli Eban, is a clarinetist who teaches at Indiana University. Eli has two children, Yael and Omri Eban. Eban's brother-in-law was Chaim Herzog, the sixth President of Israel. Herzog's son Isaac Herzog was leader of the Israeli Labor Party from 2013-2018. Eban's cousin, Oliver Sacks, was a neurologist and author. Eban's nephew, Jonathan Lynn, is a filmmaker and script writer known for satirical BBC shows Yes Minister and Yes, Prime Minister. Lynn recounts that the plot of an episode of Yes, Prime Minister ("A Victory for Democracy"), which involved the British Prime Minister bypassing his own Arab-centric bureaucracy by taking the Israeli ambassador's advice, was based on an actual incident narrated to him by Eban. In 2001, Eban was awarded the Israel Prize for lifetime achievement and special contribution to society and the State. Voice of Israel. 1957. OCLC 332941. My people: the story of the Jews. 1968. ISBN 0-394-72759-2. My country; the story of modern Israel. 1972. ISBN 0-394-46314-5. Abba Eban: an autobiography. 1977. ISBN 0-394-49302-8. The new diplomacy : international affairs in the modern age. 1983. ISBN 0-394-50283-3. Heritage : civilization and the Jews. 1984. ISBN 0-671-44103-5. Personal witness : Israel through my eyes. 1992. ISBN 0-399-13589-8. Diplomacy for a new century. 1998. ISBN 0-300-07287-2. 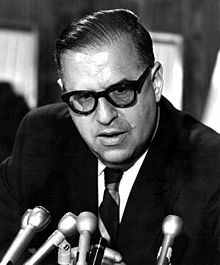 ^ "Abba Eban: Israeli statesman." Encyclopædia Britannica. Retrieved 2016-01-03. ^ a b Charney, Marc D. (18 November 2002). "Abba Eban, Eloquent Defender And Voice of Israel, Is Dead at 87". The New York Times. ISSN 0362-4331. Retrieved 22 September 2015. ^ "Abba Eban [obituary]". The Telegraph. 18 November 2002. Retrieved 22 September 2015. ^ Gaffe, Steven (2002-11-20). "Belfast's legacy to the Israelis." Belfast Telegraph. Retrieved 2016-01-03. ^ Cowper-Coles, Sherard. Ever the Diplomat: Confessions of a Foreign Office Mandarin, p19. London: HarperPress, 2012. ^ Johnson-Davies, Denys (2008). "Introduction." In: Johnson-Davies (Ed.). The Essential Tawfiq Al-Hakim: Plays, Fiction, Autobiography (pp. 1-4). Cairo; New York: The American University in Cairo Press. p. 4; this edited volume contains an excerpt from the novel, in Eban's translation, p. 201-210. ^ The translation was published in 1947 by Harvill Press, London; see: OCLC 6191719. It was reissued in 1989 under the title Maze of Justice: Diary of a country prosecutor: an Egyptian novel (London: Saqi Books; Austin, Texas: University of Texas Press). ^ a b c d e Samuel, Edwin, 2nd Viscount Samuel, and Susan Hattis Rolef (2007). "Eban, Abba (Aubrey) Solomon." Encyclopaedia Judaica. 2nd ed. Vol. 6. Detroit: Macmillan Reference USA, 2007. p. 84-85. ^ Quigley, John (2016). The International Diplomacy of Israel's Founders. Cambridge University Press. p. 136. ISBN 9781316503553. ^ "Abba Eban". Department for Jewish Zionist Education, The Jewish Agency for Israel. 2 May 2005. Retrieved 3 January 2016. ^ "Abba Eban". Jewish Virtual Library. Retrieved 30 December 2007. ^ "Plunkett Lake Press". plunkettlakepress.com. ^ Calder, John (2002-11-17). "Abba Eban [obituary]. The Guardian. Retrieved 2016-01-03. ^ Quoted in Norman G. Finkelstein (2003), Image and Reality of the Israeli-Palestinian Conflict. 2nd ed. London; New York: Verso. p. 123. ^ "Israel's diplomatic giant Eban dies". BBC News. 18 November 2002. Retrieved 3 November 2007. ^ Abbey, Alan D. (18 September 2011). "Suzy Eban, widow of Abba Eban, dies at 90". Jewish Telegraphic Agency. Retrieved 13 November 2016. ^ Call, SUSAN TODD, The Morning. "FESTIVAL LETS SOFT-SPOKEN CLARINETIST BE HEARD". themorningcall.com. "Abba Eban". Department for Jewish Zionist Education, The Jewish Agency for Israel. 2 May 2005. Retrieved 3 January 2016. Butler, Gavri (2002-11-25). "In Memoriam – Abba Eban." The Commentator, Volume 67, Issue 5. Retrieved 2016-01-03. Charney, Marc (18 November 2002). "Abba Eban, Eloquent Defender And Voice of Israel, Is Dead at 87". New York Times.